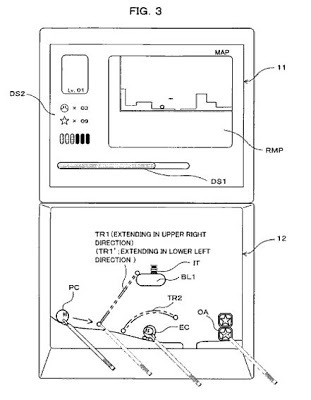 The ‘813 patent describes a handheld game whereby the player controls his character by drawing a line on the touch pad. The character can move either on the line or parallel to the line, but nowhere else. The invention can also store paths which the user can select to aid his character’s movement throughout the game. A moving character and a background image are displayed on a display screen with a touch panel thereon. When the player operates the touch panel to draw a line in an intended path extending between a start point and an end point along which the player wishes to guide the moving character, an operation trace image having the shape of the line drawn is displayed on the display screen. Then, the moving character moves along or in parallel to the operation trace image. The operation trace image is gradually erased after a predetermined amount of time elapses. Thus, it is possible to provide a video game device and a video game program in which the player can influence the moving path or the moving direction of the player (moving) character based on the shape and/or the direction of the line drawn by the player. 1. A video game device, comprising: a display section for displaying a game image; a position inputting unit for inputting a position on the game image; trace storage control programmed logic circuitry for storing, in storage locations, trace data representing a series of input positions inputted by the position inputting unit; movement control programmed logic circuitry for storing, in storage locations, position data of a moving character and updating the position data based on a predetermined rule; determination programmed logic circuitry for determining whether or not the moving character has contacted a trace based on the trace data and the position data, said trace having the shape of a line drawn displayed on the display section; on-trace movement control programmed logic circuitry for updating the position data so that the moving character moves according to the trace based on the trace data when it is determined by the determination programmed logic circuitry that the moving character has contacted the trace; and display control programmed logic circuitry for displaying the moving character on the display section based on the position data.